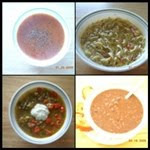 Here is the second part of the Healthy Inspirations soup event. The first part of this event has been posted here. My third contribution to this event, Hot and Sour Soup , my version is lighter on the corn starch and heavier on the vegetables as compared to the restaurant style Indo- chinese soup of the same name. 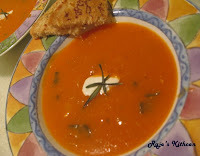 Nivedita sends in a Tomato and Carrot Soup that is uniquely flavored with dry ginger, fresh ginger,cumin , pepper and bay leaf . Nivedita makes this when someone in her family has a cold or a cough and the spices she has used help soothe the throat. 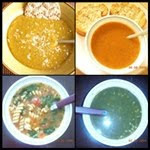 Ruchika sends in two soups, the first one, Mulligatawny Soup with lentils, onions, tomatoes and garam masala and the second one, Clear Tomato Soup flavored with cinnamon, garlic and pepper. Sowmya wants to include far more soups in her diet and begins with this wonderfully healthy Spinach Mung Bean Soup, this is the kind of soup I think everyone would love to have in their diet. If you feel your microwave does not get the workout it deserves, then maybe this Tomato Soup by Indrani will inspire you to make use of your microwave more often. 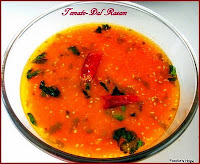 Indrani also accompanies the soup with some interesting and important health benefits of tomatoes, so be sure to check out her soup post. My last contribution to this event, Spinach Lentil Soup made with a minimum of spices so that the taste of spinach and mung lentils is not overwhelmed. Gita sends in a dozen beautiful healthy soups for this event. 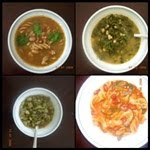 She starts with this Split peas soup that was inspired by an Ina Garten Show, then she follows it up with Tomato and fava bean soup which reminded her of tomato basil soup only with a thicker texture, Tomato soup with barley and pasta that she made in under fifteen minutes and Spinach and barley soup which combines spinach, barley and some Italian seasonings. spiced with ginger, garlic, pepper, clove, cinnamon and lemon. This is a really quick soup with masoor dhal and tomato sauce, flavored with rasam powder, red chilies, curry leaves and dry coconut. Usha from My Spicy Kitchen makes this Lentil Vegetable Soup , a powerhouse of nutrition with masoor dhal, spinach, mushrooms, carrots and beans. A hearty, healthy bowl of soup perfect for cold wintry days ! 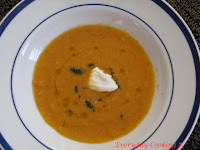 Latha regularly makes this version of Mulligatawny Soup after she resourcefully managed to get a restaurant chef to share the recipe with her. Thanks again for all your participation. In case I have missed out any one please let me know and I will update my post.